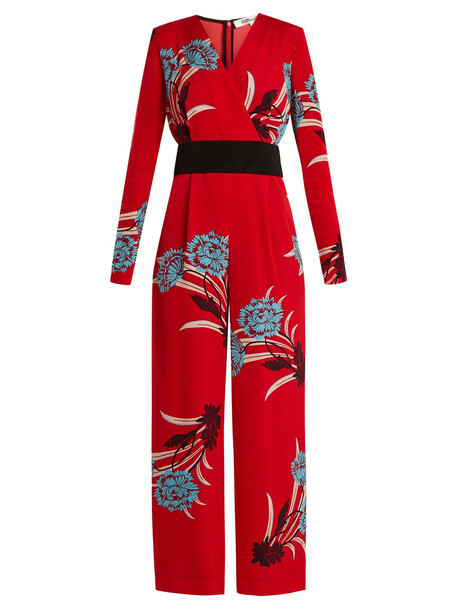 Jonathan Saunders brings the 1970s disco feel that launched DVF bang up to date with this crimson-red floral-print Farren jumpsuit. It's shaped with the signature wrap-style front which leads into a waist-whittling elasticated belt - remove it for a less-cinched look - before falling into retro-inspired wide legs that hit at the ankle. Continue the theme with black suede sandals and jaw-skimming gold hoops.